There’s a secret garden in my backyard. You can’t see it from the street, from any of the windows in my home, or from anywhere else in the perennial gardens in the yard unless you follow the path that takes you along the neighbor’s fence, behind my potting room at the back of the garage. 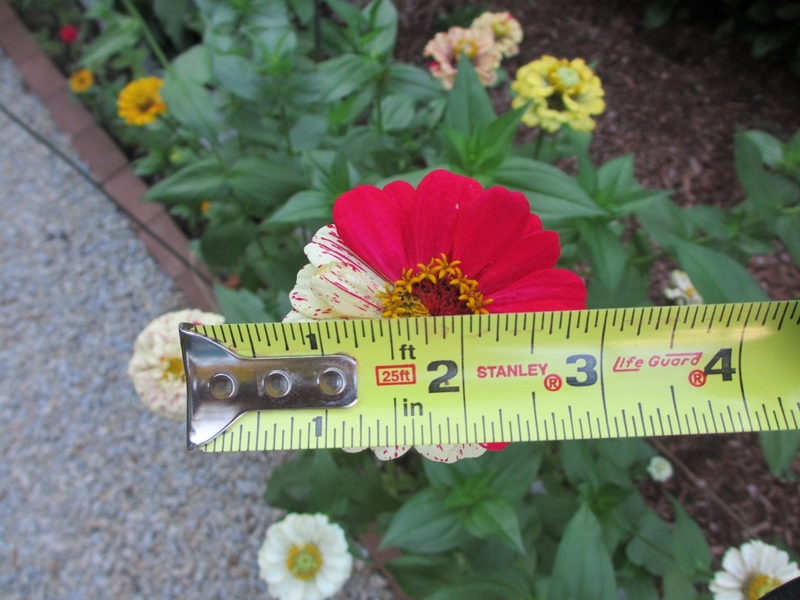 The secret garden has a long, 20+ foot row of zinnias along its path. The zinnia bed was added to the garden two years ago after seeing all of the beautiful zinnias at the Community Gardens in Nashua’s Greeley Park. I still visit there to get inspired and to visit Sophie who has the most beautiful zinnia garden you’ll ever see. This year, I planted the zinnia seeds late in June, so they just started to put on a beautiful show as we flipped the calendar to September. 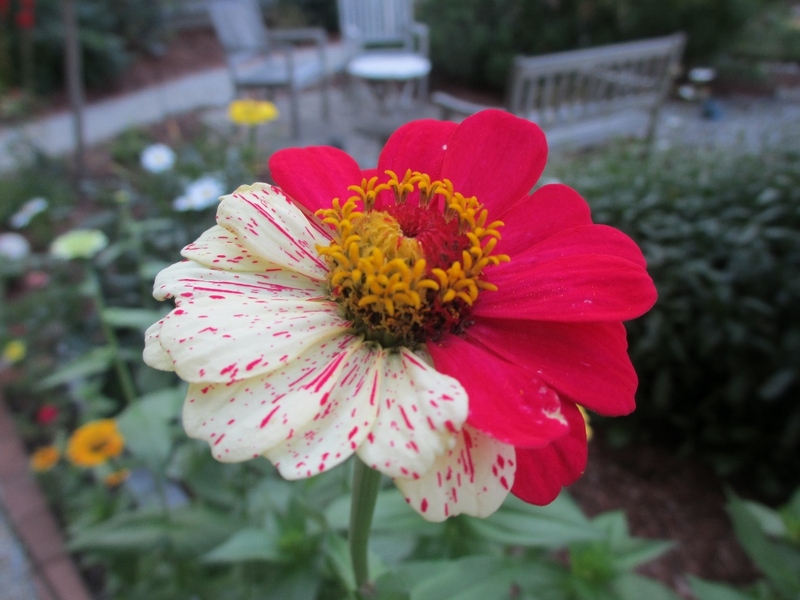 There are zinnias of every color, shape, and size that you can imagine. There is one that you’d never expect to see, let alone imagine. It stands taller than all the others. It’s nearly 55″ tall. Its blossom measures nearly 3″ across. 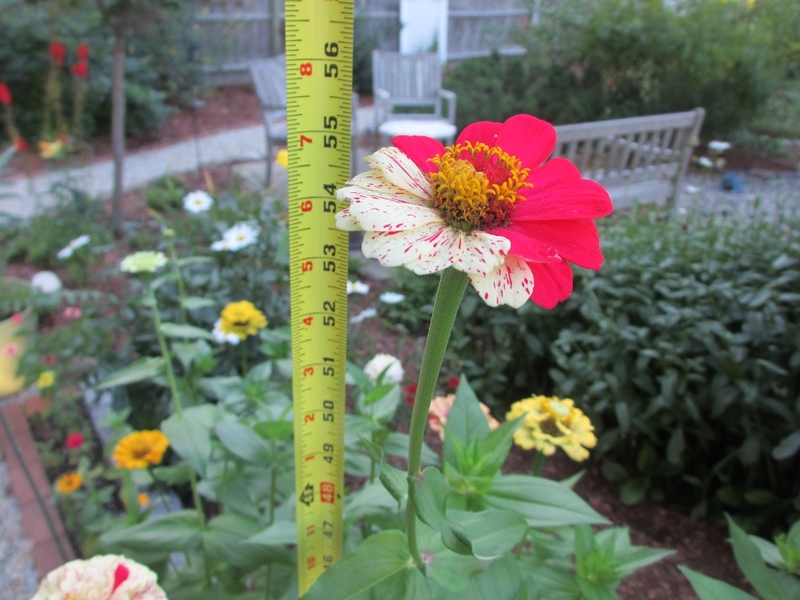 It’s a Schizo-Zinnia. This flower has two distinct personalities. It didn’t know if it wanted to be hot-pink or white with speckles. So it’s both. It looks like someone took two completely different flowers, cut them in half, and stitched them carefully down the middle to become one interesting bloom. As a gardener, I’m in awe of every flower in the garden. From April to October, I run out early each morning to see what Mother Nature has delivered since the day before. Over the past 2 weeks, the morning garden walks include a turn along the path to inspect the zinnias. Usually a blur of color and textures, I’ve walked by and have been glad to see that they are finally blooming and adding every color of the rainbow where you’d least expect it at the back of my yard. Mother Nature is incredible. She surprised me by making this special flower stand tall and be noticed. She made me stop. And look. And wonder. This flower will stay in the garden until it’s ready to be dead-headed in mid-September. Then the seeds will be saved to plant a surprise for next summer……in the now, not so secret garden. Categories: Gardening Inspiration | Tags: blooms, Garden, inspiration, Nashua, nature, secret garden, zinnias | Permalink. One of the most frequent conversations I have with my neighbors is about my dog, Grace, and how much she enjoys being the “Porch Dog” this summer. Whenever people go by, Grace is out there, relaxing under the ceiling fan, enjoying all that “porch living” has to offer! Grace enjoying her day on the porch. Grace is about 14 yrs old. I’ve had her for the past 6 years, so almost half of her life at this point. She arrived at the shelter with puppies (Seven according to her records that noted – “Do not PTS” – PTS = Put to Sleep). She also had more puppies at the shelter. I don’t like to think about this part of Grace’s life, but I know I have to acknowledge it – and appreciate the team at the NJ shelter that continuously “checked” her out and brought her back in each time ‘her time was up.’ That said, she definitely deserved to be where she ended up for the second half of her life – especially as I look at her tired, old, aging body, covered with scars stretching from her face to some of her paws, as she rests so contently on the front porch this summer . 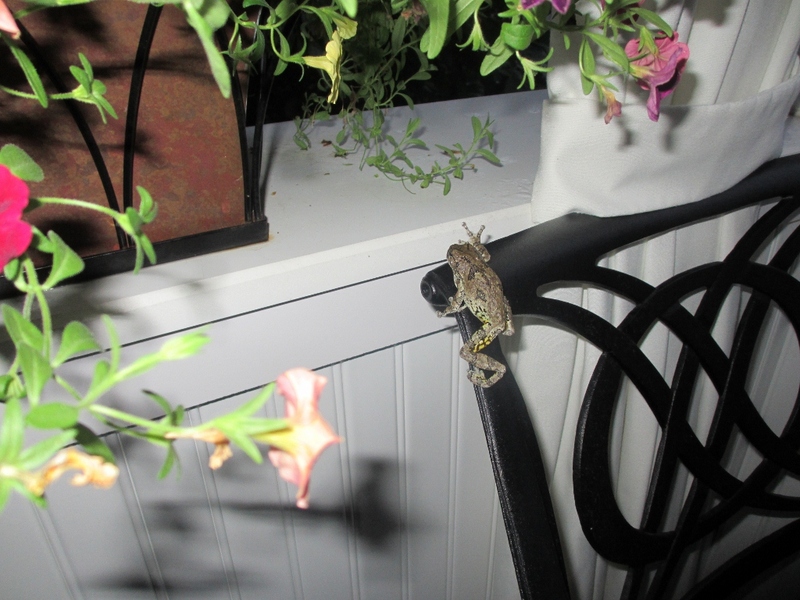 There is the “Porch Frog” that joined Grace on the porch (I mean, THE PORCH) earlier month. Technically, it’s a Grey Tree Frog – common here in NH. 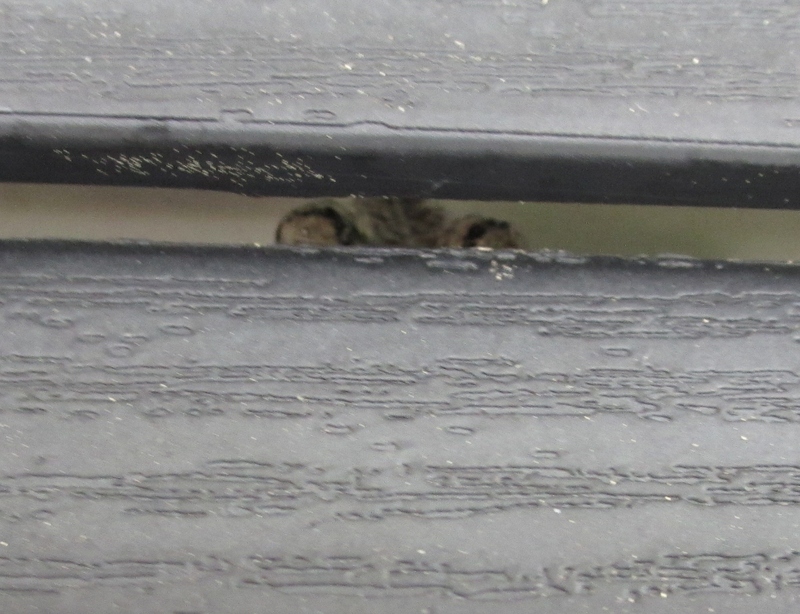 It has been hanging out during the day, taking its place behind one of the window shutters. Peek-a-Boo! Porch Frog behind the shutter. It leaves each evening as dusk sets in, just before Grace comes into the house for the evening. He heads to the garden in my backyard, I imagine to eat the bugs that only come out at night. It’s become a routine, every morning, the “Porch Frog” is behind the shutter and every evening, it heads out, hopping across the patio furniture and into the backyard. Porch Frog heading out for the night! I have a strong suspicion that Grace and Frog are true porch companions and we’ll never know what they talk to each other about all day long! 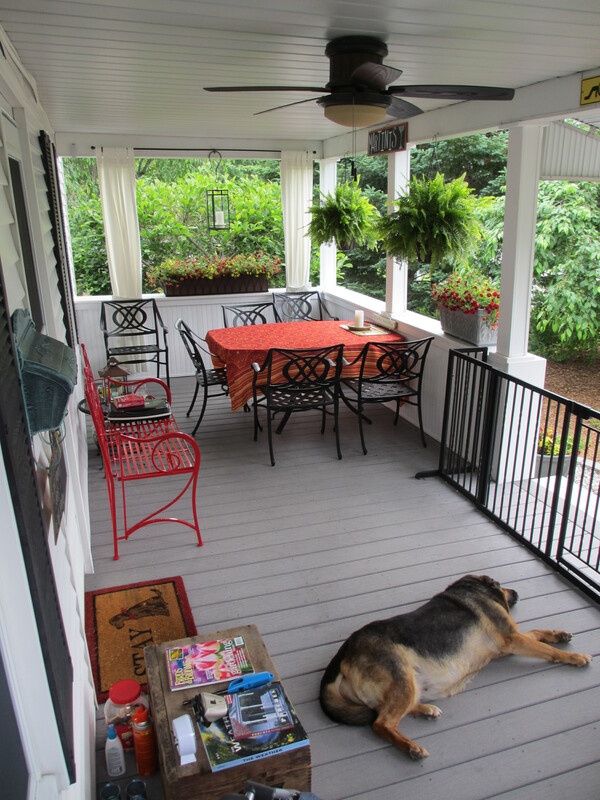 Categories: Dog Days in the Garden | Tags: animals, dogs, frogs, front porch, Gardening, nature, NH | Permalink. I’ve run out of room in my backyard garden to grow vegetables. My grandfather would find this fact hard to believe if he were alive today. 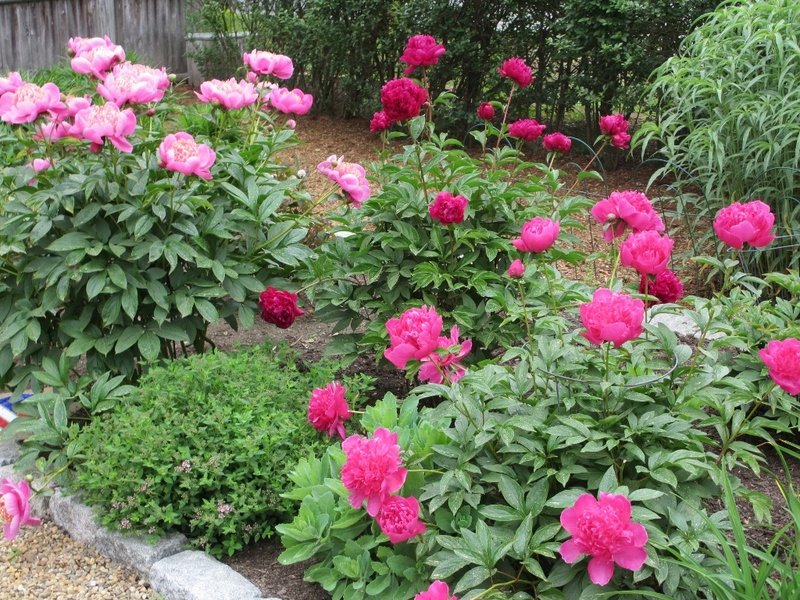 Peonies in bloom late May this year. The lawn was replaced with perennial gardens filled with flowers – selected by trial and error – for a Zone 5 garden. And slowly, over the years, flowers and shrubs have filled in the area of vegetable garden. The old oak and maple trees next door have also pushed their roots into my yard, making it nearly impossible to prep the soil for a new vegetable garden each summer. The tomatoes, eggplant, peppers, and herbs were all moved to containers throughout the perennial gardens, but the results of this effort have varied over the past few years. Then Peter stopped by the house. He grew up in my neighborhood. He knew my mother and other neighbors when they were all kids back in the 50s and 60s. My mother and I also knew his mother and aunts because they all had homes nearby. Peter shared info about the community garden at Greeley Park in Nashua. And even better, he offered to share some of his space in 2012. I thought he had forgotten about our discussion last August. 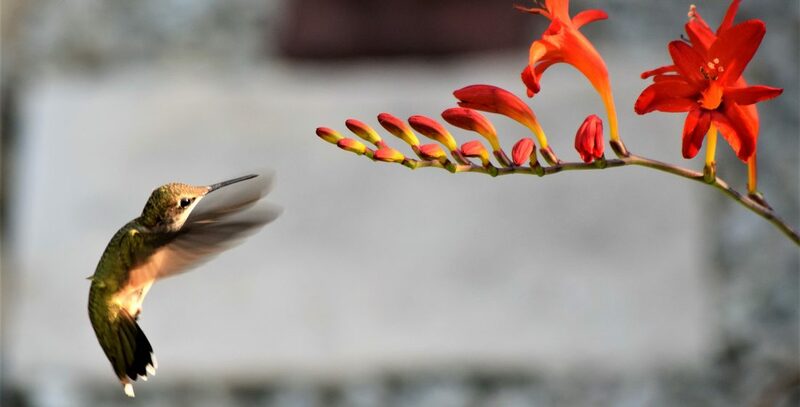 Then, out of the blue, he stopped by my house the Sunday morning this past Memorial Day weekend with news that the garden was ready to plant! Better yet, water would be free and he ’tilled the soil so it was ready for plants! Oh…AND there was A LOT of space – so much that this area is actually being tended to by my mom, two other neighbors, and me! We just had to get the seeds/plants and take care of our section. To say that this summer’s gardening experience has been interesting is an understatement. Waking up at dawn to tend to a garden across the city at 6:30 am on the weekends is something I would have NEVER considered in the past. This summer, it just seems natural. (I have to go this early to avoid the full sun and heat of the day and to ensure that I have time to deal with the garden at my house later in the day!) The early mornings are the most peaceful at Greeley Park. Especially during these last few weeks of summer. I love that the sunflowers greet me whenever I visit the gardens at Greeley Park. 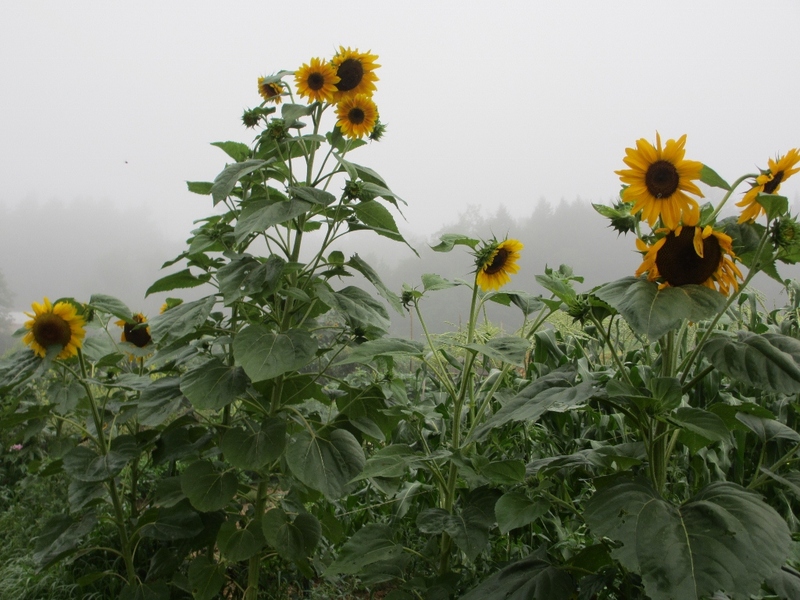 Sunflowers on a foggy morning at Greeley Park. The jury is still out whether having two different gardens to tend is worth the effort. Some days, when all I can pick are blossom-rotted tomatoes, it seems more like work vs. a passion or hobby. This morning was different. My mom and I took Grace out for a ride to visit the garden. This was a big deal because Grace is getting up there is age – she’s about 14 now and it’s more of an effort for her to get into and out of the car, so we have to plan her trips to include visits to the gas station and bank (both stops offer biscuits at the drive-thru!) Today’s trip included a garden visit. There were no other people in any of the gardens and it was great to see an old dog be so excited to visit a new place and sniff so many new smells! She was ready to run down the path, as soon as she leapt out of the car! Once we arrived to our ‘plot’, it was exciting to have so many things to pick since my last visit four days ago. 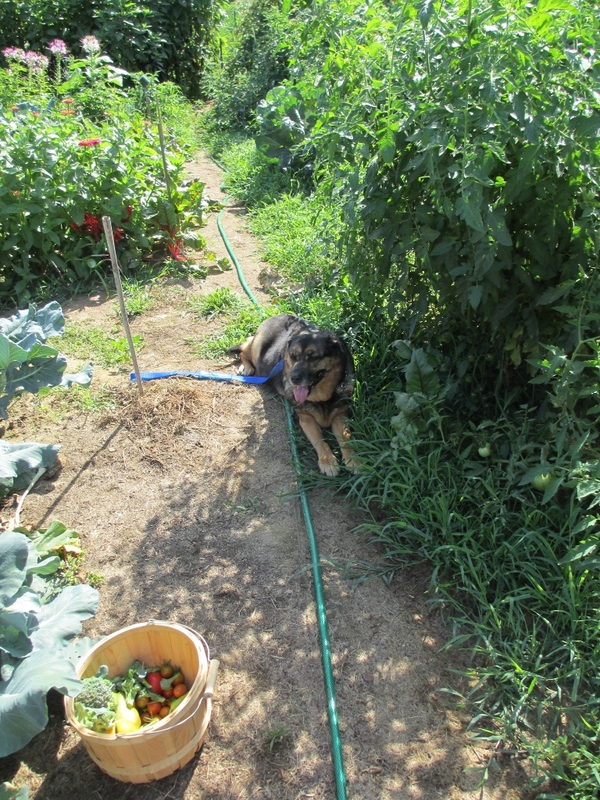 Grace found a nice shady place to rest along the tomato path while I (almost) filled my harvest basket. Grace rests in the shade cast by the tomatoes. The cherry tomatoes are all ripening at once, which is good because we also have a bummer crop of seranno chili peppers – fresh salsa is definitely on the menu for later this week! The broccoli is still sending off enough shoots to fill a dinner plate each week and the eggplant (which were planted late) are all in bloom and look great for (hopefully) a late August harvest! Some things are not doing so well, but I won’t dwell on that today. With such a short gardening season in NH, I’ve found it more productive to focus on the good things. Categories: Dog Days in the Garden | Tags: dogs, Gardening, Nashua, nature, NH, plants | Permalink.